Not since 1993 has a Canadian team won the Stanley Cup. It just does not seem right does it? It looks like the drought will continue this season as only one of the seven Canadian teams in the NHL is poised to make the playoffs, that being the Montreal Canadiens. Since the Holy Grail was raised by the Canadiens, all of the remainder of Canada teams have made it to the Finals (save Toronto) with the Vancouver Canucks twice (1994 and 2011), the Calgary Flames (2004) and the Edmonton Oilers (2006) all taking it to seven games. It almost seems like there is a curse because quite frankly the Canucks should have won in 2011, the Oilers should have won in 2006 and the Flames should have won in 2004 as those teams were firing on all cylinders and it could be argued that some questionable calls or unexplained circumstances lead to the US based teams winning the Cup those years. So just why are the Canadian teams struggling so much? The Hockey Fanatic looks at seven reasons the seven Canadian teams are struggling to win the Stanley Cup. US Expansion – arguably the number one reason is that the NHL has expanded into a number of markets in the US. 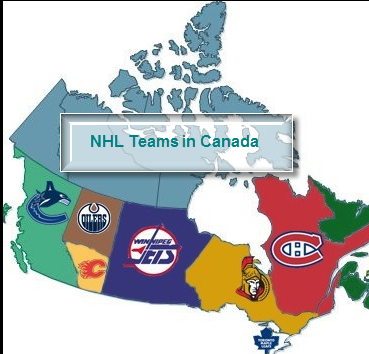 Throughout most of the 80’s and into the early 90’s one third of the NHL’s teams were based in Canada. The odds were obviously better for a Canadian team to make it deep into the playoffs back then. Many fans will debate the fact that the talent pool in the NHL has been watered down as well due to NHL expansion where the rich get richer and the poor get… well you know where this story goes. NHL Players Desire to play in “hot” markets – pun intended, it is no secret that hockey players and in many examples their girlfriends or wives prefer to live in a warmer climate. As recent as last month when Roberto Luongo was traded from Vancouver back to Florida (where he met his wife) there are numerous examples of players not willing to waive a trade to destinations such as Edmonton, Winnipeg, Calgary or even Vancouver. Of course Luongo’s case was a little different but it is no secret that Florida was #1 on his list of preferred trade destinations. I bet if we polled the players who in fact have special trade clauses or lists of teams that they would not like to be traded to that list would almost always include a couple of Canadian cities. (Which is quite surprising considering the great country that Canada is…). The fact is that in Canada, the weather is colder, winter is longer, the taxes are higher and the cities are smaller so player are less conspicuous in Canadian markets. Rumors persist that one of the reasons why Chris Pronger requested a trade from Edmonton was because his wife did not like the city. While I’m not sure what the exact story is, the fact remains that the Canadian NHL teams are at a disadvantage when it comes to signing free agents or attracting big names in trades due to their location. The Canadian $$$ – while not as much as an issue as in the nineties when the drought started, the lower Canadian dollar has worked against the Canadian teams in being able to attract and more importantly keep talent north of the border. The Edmonton Oilers come to mind in reviewing all of the great players they lost in the nineties. They probably should have won another couple of Cups in the early ‘90s but the team was dismantled and was unable to remain competitive. Relocation – Both the Quebec Nordiques and the original Winnipeg Jets relocated in the nineties moving to Denver (Colorado) and Phoenix. In the case of the Nordiques they went on to win the Stanley Cup the year after they moved from Quebec to Denver beating the Florida Panthers four games to zero to hoist the Cup in 1996. Talk about adding insult to injury. Pressure – you would think that professional athletes would be better able to handle the pressures of playing their sport. The fact is that regardless of what Canadian market you are in as a player or coach you are under a microscope and there is most certainly extra pressure on the players to perform in these cities. Jeez how bad do Toronto Maple Leafs want their team to win the Stanley Cup? Or how about the Vancouver Canucks or Winnipeg Jets? Or what about storied franchises of the Montreal Canadiens or Edmonton Oilers? Add to the mix the Ottawa Senators and you have a lot of fans of Canadian teams who are thirsty for a win and a sip out of the Stanley Cup. Players are competitive and they want to win, but there is some extra pressure to perform in the Canadian markets. The League Itself – do you think the NHL as a League would be happy if year in year out a Canadian team was winning the Stanley Cup? Seriously, with the large TV deals and market potential of the US based teams the League was obviously trying to grow the sport throughout the US. Expansion to sunbelt areas was no coincidence. While Wayne Gretzky is credited in growing the game in the US, it was really the mastermind of the likes of Gary Bettman and Bruce McNall and certain members of the Board of Governors who wanted to expand into US markets. Personality conflicts aside it is np coincidence that the League did not want to sell a franchise to Canadian billionaire (at the time) Jim Balsillie because he was quite vocal that he wanted to move a team to Canada. On three occasions he was denied attempts to purchase the Pittsburgh Penguins, the Nashville Predators and the Phoenix Coyotes. Gary Bettman works for the owners and there is a somewhat old gentleman’s club where the billionaire owners call the shots and for the most part treat their team as a business (which they should) but the buck stops with the owners and Gary Bettman. He has grown League revenues albeit through multiple work stoppages. (The NHL is the only professional sports league to miss a complete season due to labor unrest). Call it a conspiracy theory but the League has made a number of changes that have worked against the Canadian teams when it comes to being able to win the Stanley Cup. Does anyone remember the fact that the League gave an extra day off between games six and seven? Or the additional day off between games one and two? The Vancouver Canucks had momentum in both cases which was stalled by these small facts. The Canucks were flying high after a game 6 win of 4-1. The Canadian Curse – While I’m not a believer in curses, many hockey players are superstitious. Hockey fans as well. In 2004 when the Flames were taking on the Tampa Bay Lightning, there were some questionable calls that resulted in power-plays for the Lightning who had a pretty lethal power-play, and scored on a few of these chances. I’m not suggesting that the League had anything to do with it but for whatever reason strange things happen when a Canadian team has been involved in the Finals as of late. Luongo’s commentary on the Bruins Tim Thomas during the 2011 Finals seemed to be the turning point. Dwayne Roloson of the Oilers getting hurt in game one of the Finals vs. the Hurricanes turned the tide for that game and the entire series. In game one, Carolina tied the biggest comeback in Stanley Cup Finals history, overcoming a three-goal deficit to win, 5–4. In the third period of this game, Oilers goalie Dwayne Roloson suffered a series-ending knee injury in a collision and was replaced with backup Ty Conklin. With 32 seconds to go in regulation, Conklin misplayed the puck behind his own net, and it deflected off Jason Smith’s stick to the front of the empty net where Rod Brind’ Amour of the Canes buried it. I still lose sleep over this. It has been way too long of a drought for long suffering fans of Canadian NHL teams. It does not look that the drought will be ended anytime soon. Fans of the Montreal Canadiens, Ottawa Senators, Toronto Maple Leafs, Winnipeg Jets, Calgary Flames, Edmonton Oilers and Vancouver Canucks have had to endure teams such as the Tampa Bay Lightning, Carolina Hurricanes, Anaheim Ducks, Colorado Avalanche and Dallas Stars hoist the Stanley Cup. It sure is sad that no Canadian team has won the Stanley Cup in over twenty years. Wow, just wow.